"... the incandescence of the piano playing is astounding ... the most important virtue of the package is the sound ... there is sufficient air and life in this recording to facilitate time travel. Forty-four years collapse and we are there." "Five Stars .... crisp and clear, the sound has weathered the years ... three musicians in their prime ... shows Evans in both swinging and contemplative modes and highlights the trio's superb interaction ... along with the leader, both contribute masterful solos here ..."
"... the most important live Evans document to emerge in decades and the most rewarding on multiple levels ... it's just prime Bill Evans and the results are nothing short of astonishing for three reasons ... first, the sound is breathtaking ... will make you think you have been seated at a table placed on the stage in the middle of the musicians. I kid you not: the fidelity is that vivid and intimate ... second, the song choices are a dream ... spirited and exciting versions ... third and perhaps most important, Evans' playing is electrifying and loaded with confident and lyrical risk-taking ... a masterpiece ... for those who have spent years yearning for a highly intimate Evans recording that brings the artist as close as possible to the ear and provides marvellous material and execution, your ship has finally come in." 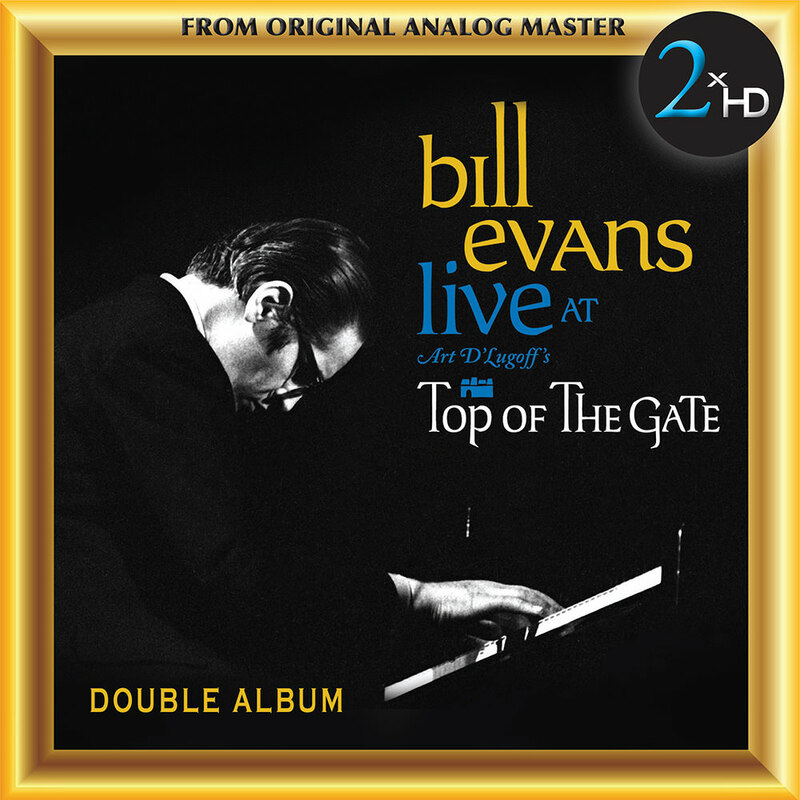 Live at Art D'Lugoff's Top of the Gate offers a table at the front of the stage for a stellar performance by one of jazz's greatest trios, recorded in Greenwich Village on October 23, 1968. Pianist Bill Evans is joined by bassist Eddie Gomez and drummer Marty Morell for two breahtaking sets, represented here in their entirety. Aired only once on Columbia University's radio station, the concert hadn't been heard for more than 40 years and had never been released in any form until this double album came out in 2012. Throughout the two sets, Evans showcases his gift for interpreting standards, playing only one original over the 17 tracks. George Klabin, then a 22-year-old recording engineer, was granted unprecedented access and he conscientiously positioned separate microphones on each member of the trio, yielding a pristine mix that's the next best thing to being there. "Being able to hear jazz up close, as I did in clubs, I was dismayed by what I heard on live recordings. The sound was so often muddy and distant and not satisfying. I wanted to capture the intimacy ... one of the best experiences of my life. This was one of the best Bill Evans trios playing during a period, on a night, where Bill Evans was at his best." For the 2xHD transfer of this recording, the original 1/4”, 15 ips NAB master tape was played on a Nagra-T modified with high end tube playback electronics, wired with OCC silver cable from the playback head direct to a Telefunken EF806 tube. The Nagra T has one of the best transports ever made, having four direct drive motors, two pinch rollers and a tape tension head. We did analogue transfer DSD 256 (11.2 MHz) using Merging Horus/Hapi A/D converter and a dCS Vivaldi clock. Each format (96 kHz, 192 kHz, DSD 2.8 MHz and DSD 5.6 MHz) was created from that transfer.